Available in Flat Dark Earth and Black! The first and only folding stock adapter compatible with AR platform rifles. The Law Tactical Folding Stock Adapter works with direct impingement or gas piston systems and fits A2, carbine, mil-spec or commercial buffer tube and stocks. It can be used with standard bolt carrier groups including: full auto, semi auto, 5.56 to .308. 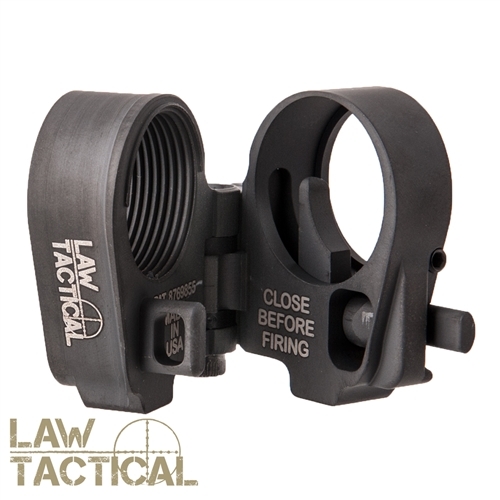 The Law Tactical Folding Stock Adapter was designed for low profile transport of AR rifles in non-permissive environments. The adapter is ideal for any situation that requires a smaller profile weapon for transport and storage. Simple one-button release folds the stock. To engage, just unfold and fire. The stock automatically locks into place, requiring no fine motor skills. Designed, built and assembled in the USA from CNC machined, 4140 steel. The adapter does not affect gun function when unfolded in the standard fire position. The rear portion of the adapter is built to the same specifications as a standard receiver to ensure maximum compatibility. An integrated single point sling attachment point is included. 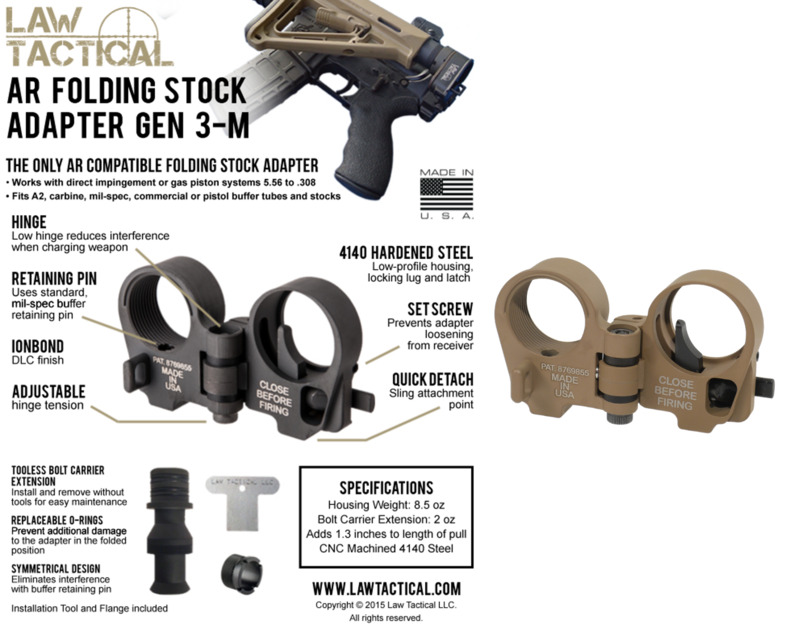 NOTE: This item is designed for Mil-Spec components, some aftermarket parts will not work with the 3-M Adapter, including JP Silent Capture Springs and a some 9mm caliber setups.